Hired by the city, attorney Lauren F. Goldberg read tag numbers from the ballot precinct boxes to community development secretary Nancy Hudson. 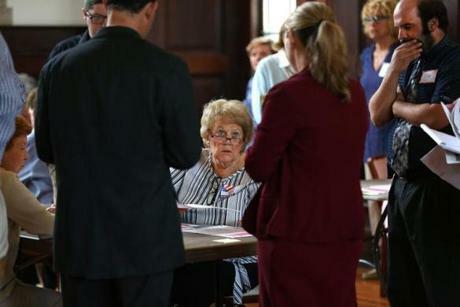 METHUEN — Madeline Varitimos, the 79-year-old chairwoman of the Methuen Board of Registrars of Voters, lifted her thick magnifying glass to inspect the ballot in question. The ovals next to two congressional candidates were filled in, but one had an X through it. 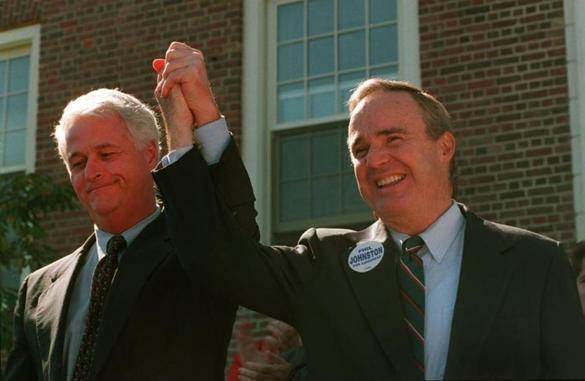 The story behind the 1996 recount in Mass. “Because the X was so clear and definitive,” Varitimos said, the intent was to obliterate the vote for Dan Koh of Andover and cast the ballot for Lori Trahan of Lowell. Her colleagues agreed. Such was the drama and routine at the beginning of a sprawling five-day ballot recount process in the Third Congressional District’s Democratic primary. Spanning 37 cities and towns, the recount has set out to tally by hand 89,000 ballots to determine a nominee who will move on to the Nov. 6 general election to face a Republican and an independent candidate. In the primary’s original tally, Trahan, a former congressional chief of staff, topped a crowded field with 18,527 votes. But Koh, a former mayoral chief of staff in Boston who trailed her by 122 votes, gathered the necessary signatures to request each ballot in the district be counted by hand. And on Thursday, Koh appeared to be attempting to further fan flames of doubt about the outcome. First, some background: On Monday, Secretary of State William F. Galvin formally ordered a recount and also said he was taking control of the elections departments in Lowell and Lawrence, the Third Congressional District’s two largest cities. He cited staffing issues in Lawrence and said there had been administrative errors in how Lowell dealt with the Sept. 4. election, which also prompted him to initiate an investigation into the practices and procedures of the Lowell elections department. The counter and caller at this table were surrounded by observers. On Thursday, Koh’s campaign dispatched a letter to Galvin asking him hold off on recounting the ballots in Lowell — Trahan’s hometown and the municipality in which she received the most votes — until the secretary completed the investigation into what happened during the primary. “We are gravely concerned about the credibility of the Lowell election result,” wrote Koh campaign lawyer Gerald A. McDonough. 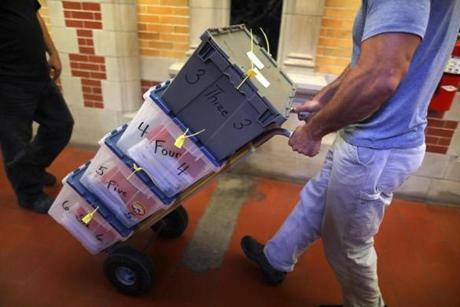 Lowell’s recount is set to begin Sunday at 9 a.m. at Lowell High School. The legal epistle prompted a tart rebuke from Galvin, the longtime top elections official in Massachusetts. The first load of ballots is rolled down the hall from the city clerk's vault. Galvin said there is a presumption of regularity in the conduct of the election. 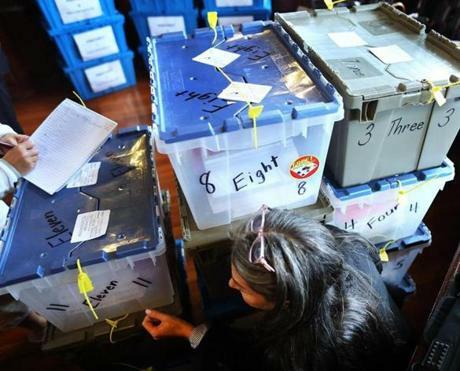 “It is my intention to sort the ballots into blocks to be counted and complete the recount before Monday,” he affirmed. One area of concern raised by the Koh campaign about Lowell was the high number of blanks in the race, instances in which voters were not counted as choosing any of the 10 Democratic candidates on the primary ballot or a write-in, even as they may have voted in other races. Meanwhile, in Methuen, the first municipality to begin the slow and careful process of tallying each ballot by hand, the recount was underway in a third-floor room at City Hall. 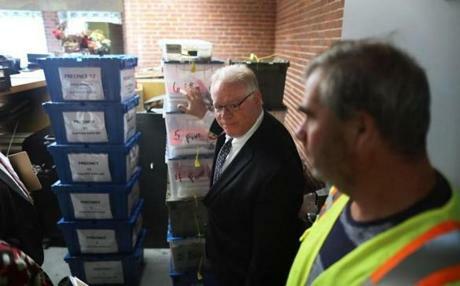 After opening the vault, Acting City Clerk John J. Wilson Jr. directed the removal of the sealed ballots. One teller looked at a ballot, determined for which congressional candidate the voter intended to vote, then said the name aloud (for example: “Koh”) and waited several seconds. Then the other teller tallied the result by pen. The languid process was by design. Two observers from the Koh campaign and two observers from the Trahan campaign hovered over each table, watching with intensity. The extended counting gave them time to object to any determination they doubted, and flag down a campaign attorney. The one protested ballot was judged and decided by the local Board of Registrars, sitting a few feet away. Rulings made by that board are binding and any appeal of its decisions will end up in state court. With Koh’s Thursday letter, some observers think that is exactly where the fight for the Democratic nomination will end up. The district leans Democratic and national Democrats and Republicans believe the Democratic nominee is likely to succeed US Representative Niki Tsongas, who is retiring.